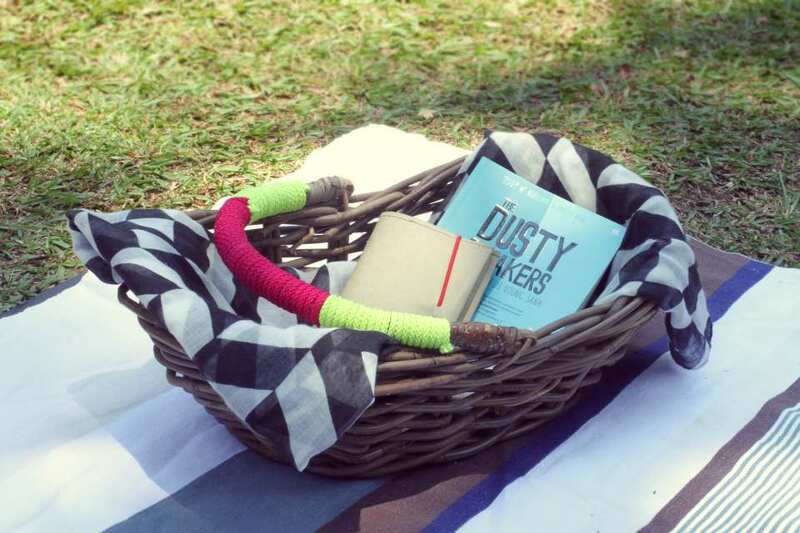 Behind the pages of every book, there is a trembling writer, and in the case of The Dusty Sneakers: Kisah Kawan di Ujung Sana, there are two. Writing a book is one of the scariest things that Twosocks and I have ever done in our lives. This came as a surprise to our friends when we shared this with them. Some thought that it should be a piece of cake for us, considering that we’ve been blogging for five years and it is our own life story. Others thought that because we are two of the biggest bookworms they know, we have lots of references up our sleeves and writing should then be a breeze. 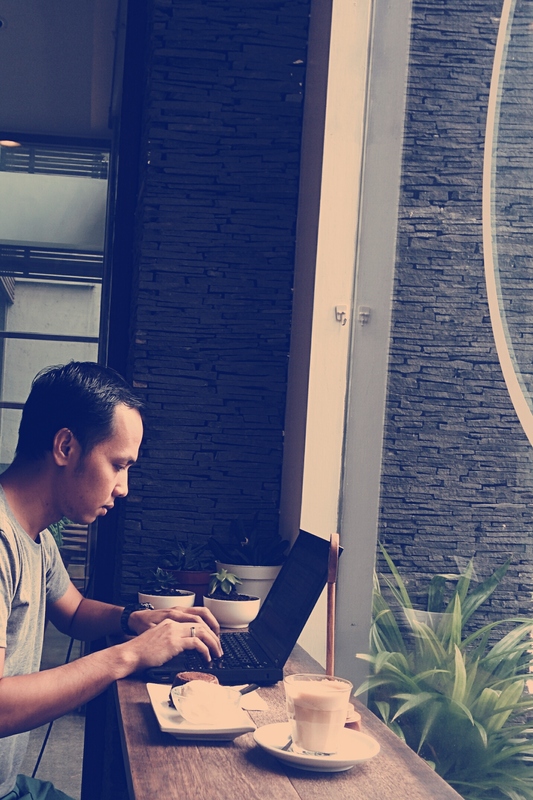 For one, for us blogging is very different from writing a long narrative. Blogging is about sharing experiences in a flash, documenting moments so they won’t escape our memory one day. On the other hand, a long narrative such as a book needs a story line, richer details, and deeper reflection that should stand the test of time. For another, it was precisely because we grew up reading brilliant authors that we found writing a book so daunting, for there is a very slim chance we could measure up to our idols. But then, as Eleanor Roosevelt advised, it is healthy to do something that scares you every day. For the nine months we worked on the book from ideating through proofing the final lay out, this book has been that scary thing we undertook every single day. There were days when I felt the fear to be paralyzing, but along the way I found some insights that made me pick up my pen again. The first help came from John Steinbeck, who gave this brilliant advice. “Forget your generalized audience,” he said. “In the first place, the nameless, faceless audience will scare you to death and in the second place, unlike the theater, it doesn’t exist. In writing, your audience is one single reader. I have found that sometimes it helps to pick out one person – a real person you know, or a imagine person – and write to that one.” This was the first advice that snapped me out of my funk, for when I followed his words and picked Twosocks as the single reader I wrote to, I felt that I have found my compass. Gone was the need to please thousands of faceless people and what came in was a desire to write something that one real, tangible person could enjoy. Steinbeck helped me to start writing, but the fear came back when I encountered that fabled nemesis of all writers: the writer’s block. I made the time, I picked a comfortable place and created the right ambiance, but no words came out. After reflecting for a while, I found out three reasons why. The most often case was that I had nothing important to say, what I had in mind was something I myself don’t even find interesting enough, and so what I need to do is to go back to thinking what it is that I really want to say and why. When I was sure I have something important to say but couldn’t write, it was usually because I have yet to figure out how to say it, and being an analogue thinker, I couldn’t find out how by typing away. So I usually grabbed my notebook and toyed with outlines until I find one that I feel happy about. The third reason, and usually the rare one, is because I was genuinely sick of writing. It is hard work, after all, and you sometimes need to get away from it to gain enough energy to dive back in. When I felt this way, I either resort to a physical activity (like taking a walk or swimming) to rest my brain or bury myself in a good fiction, for reading good writing is what really motivates me to write again. Another kind of fear seeped in when the book was being printed, a fear that still lasts until today: what if nobody reads the book? What if people hate the book, our labour of love? Logically, I know that it is something beyond my control and I know that the book is something I proudly stand by, but the thought still makes me tremble. 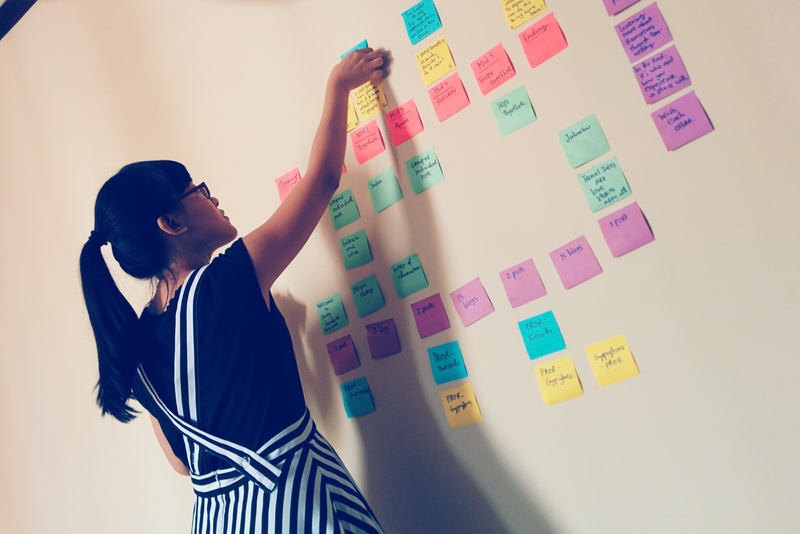 The only way to get over this, I found, is to do what we can for the book and dedicate our energy to pursuing other equally scary ideas – like switching jobs, doing Tur Kartini, and our most recent scary adventure, setting up POST, our creative space at Pasar Santa. So yes, writing The Dusty Sneakers: Kisah Kawan di Ujung Sana is one of the scariest things I’ve ever done, and I am very happy that I did it. 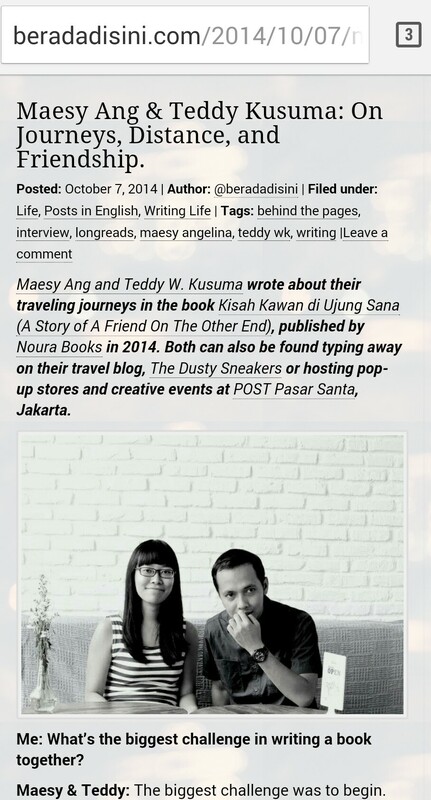 Twosocks and I are also very happy that Hanny Kusumawati, a brilliant writer and one of the kindest, most genuine person we know, invited us to share stories about our writing process in her Behind the Pages column. Not only she asked thought provoking and heart-string tugging questions, revisiting our writing days also made us eager to do it all over again. May the day when we can say that we are writing our second book and feel scared all over again come, sooner than later. Until then, you are welcome to reminisce with us – the story is right here, at beradadisini.com. I’m going to take that John Steinbeck’s advice too. Where did you find it? Oh, right, I like this blog (last week i started to follow and has read some latest posts since). Thank you, that’s lovely to hear 🙂 Yes, John Steinbeck is pretty amazing. I found his advice on Brain Pickings: http://www.brainpickings.org/2012/03/12/john-steinbeck-six-tips-on-writing/, the URL is also linked in the post above. My favorite John Steinbeck advice is on love, to his young son: http://www.brainpickings.org/index.php/2012/01/12/john-steinbeck-on-love-1958/ Enjoy! Thank you, I'll bookmark the links. Great motivational piece Gypsytoes, plus you reminded me of brainpickings existence. I should learn from you :). I love writing, and so far just writing for my blog. Once I was brave enough to send 4 of my stories to Bentang Pustaka, and thank God, they were published in novel compilation . But then I stop. Dunno, maybe like you said, having writer’s block, or…..just have not much time due to my main job :D..